Inhabitate Bridgeotwn. Place: Hester Cascades. Photo: (c) Marnie Orr. Body: Jess Morris, getting to know her materials through weight & gravity (see discussion below). How can we invite audience members to include their own process in visiting the work? Write / say / record 3 words. in the middle of their experience. Give them something to take at the end. Cris on the mike with camera person - at a process. Come up w 3 words if they were to engage with me around the protest. what brought you here, what do you see, etc. Invitations are a powerful thing. But requires facilitation. Invitation needs to be presented from an established intimate space. Audience members invited to throw lights over the river to the other side of the bank, to light up performers in a boat on the river. In my perf practice (Marnie) I feel unable to transport the work from one site to another. Choreography and movement work, for me at this stage, rarely is able to be honestly transported. one loses one's connnection and immediate response-ability to materials / and surrounding subjects because they are different. And charcoal may be some part of the existing environment that has contributed to it being green now.. can you tap into that in the site, Cris asks. That's why this work is all about time. Going on from conversation with Rachel last night, it's about relation into time, timing, tempo, speed, macro/micro - which i believe is not about space, but about the same thing - same place - happening simultaneously. Human limitation to be able to access ancient knowledge that is not nec immediately evident. ie we require TIME to be in an environment - working physically there in that place, to pick that stuff up. Therefore if we are going to present this work - in any way with bodies, we need ~ a week prior to production. We need time to work and get to know our materials. PRIOR: know the footage/image groupings what we want to achieve. THEMES ESTABLISHED. Kim’s gigapan – just 1 image as projection from hanging fabric – walk around it. Or as a poster. Most of the images are compositional in themselves, or textural. Media Jam, Feb 09, CIA West Perth. Creator: Marnie Orr. Photos: Mia Holton. Bodies:Michelle Outram (top), Justin Morrissey (standing left), and in scrims - Maitland Schnaars, Thomas Kelly, Gina Knight, Meg Norris. Screens originally from Stratus999 (Cairns, 1999) created with Leah Grycewicz and Marnie Orr. Painted by Cristina Santolin & Marnie Orr, 2005. If inside, maybe in a hallway, giving space for people to drop/transform. Start in research room, leading to a room of the photographs – pinnacle of work. RESEARCH ROOM - not exposing process. But extended comment. Morning training and dialogue on video, sound files – make into overlayed piece, then worked into the space. Reference books attached on strings. Body clean / body dirty. Black and white – using charcoal – contrast. Lead pencil. 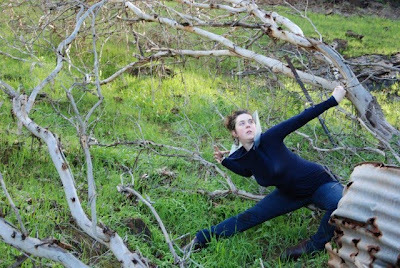 Ways of framing the event – live movement making process. Extended comment – review about that series of micro events, within a macro event. Series of relations – perf as a temporal events encompassing a series of diff events. Playing with the time frames. Post-production treatments of images into black-white. Present words in a space exposing the integration of dance/photog mediums. Charcoal as a main process. Devastation / transfer of properties with eg tree w no life but aschen substance. Writing as a big process. Revealing process of choreog engagement w these materials. Rather than just these poetic interface. A way of putting a proposal together. Would fit w PICA. 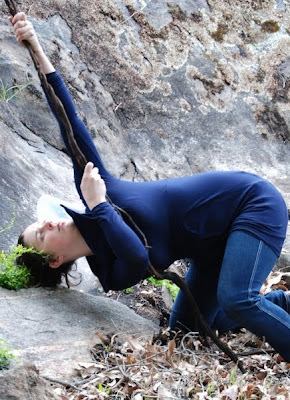 The dancing body and media person at work, matching the physical properties with each other, drawn from the textural encounters with the immediate environment. The result is a textural congruency. Welcome all groovers from the Bridgetown R&D phase of Inhabitation Bridgetown. Please add your blog at will.